Brandon Einstein will soon be off to college, but he’s not letting the summer months slip away without squeezing a few more memories out of his current golf era. The 18-year-old from Clemmons has qualified for the U.S. Amateur Championship at Pebble Beach on Aug. 13-18. That achievement came just weeks after Einstein capped off his junior career by winning the 51st North Carolina Junior Boys’ Championship at Maple Chase Golf and Country Club in Winston-Salem in June. Einstein survived a four-way playoff at the U.S. Amateur Championship Sectional Qualifying at Oak Valley Golf Club in Advance to earn one of five spots. After carding a 71-66 after 36 holes, he birdied the first playoff hole to secure his position. He reached the 10th green in regulation, then holed a 25-foot putt dead center. He called his second-round 66 the best tournament round he has ever played. Now it’s off to Pebble Beach, where he will see how he measures up against the best amateur golfers in the country. Prior to the U.S. Amateur qualifier, Einstein was already riding high following his performance in the North Carolina Juniors. After a stroke play qualifier, Einstein won six matches over three days to secure the win. The title helped validate his belief that he could play against top competition. “I feel like – I don’t know if ‘burden’ is the right word – but just being able to break through and finally do it is lifted off your shoulder,” he said. His timing couldn’t be better. Einstein will enroll at High Point University this summer. He considered UNC-Wilmington and N.C. State before accepting a scholarship offer from the Panthers. Einstein’s college career is starting a year earlier than he anticipated. After three years at West Forsyth High School, he transferred Forsyth Country Day, dropping back from the class of 2018 to the class of 2019 in order to accept an offer from High Point next year. But in January, Gregor told Einstein that a player was leaving the golf program, opening the door to join the program in 2018. He juggled a couple classes to meet his senior requirements and graduate with the class of 2018. But even with the excitement of college looming, Einstein is determined to make some more memories. 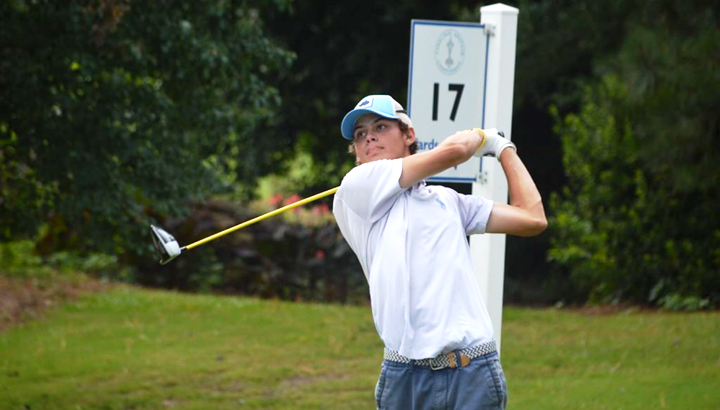 In July, he finished tied for fourth (72-71-72-71-286) at the 104th Carolinas Amateur at the Country Club of Carolina in Pinehurst, a result as noteworthy for its consistency as for its overall performance. “It was honestly just staying focused because the greens were so fast that, if you were off your game for even one shot, you would easily drop a shot,” he said. In the final days of his junior career, Einstein will pack in a few more tournaments. At the same time, he will indulge another favorite pastime – one that doesn’t require leaving Bermuda Run Country Club. After Brandon puts in a round of golf, he grabs a fishing pole. Putting a line in the water helps Einstein get to a good place mentally, which is always a benefit for a golfer.